The apartment has a living room with electric fireplace, cozy dining area, double sofa bed, flat screen TV and radio and a subsequent south loggia and a separate bedroom. The kitchen is very generously furnished with fridge-freezer, oven, microwave, bread slicer and kettle. In the bathroom, you can choose between shower and bathtub. A carport is available and your bikes are in the garage. For a stay less than 1 week linen and towels are brought please. 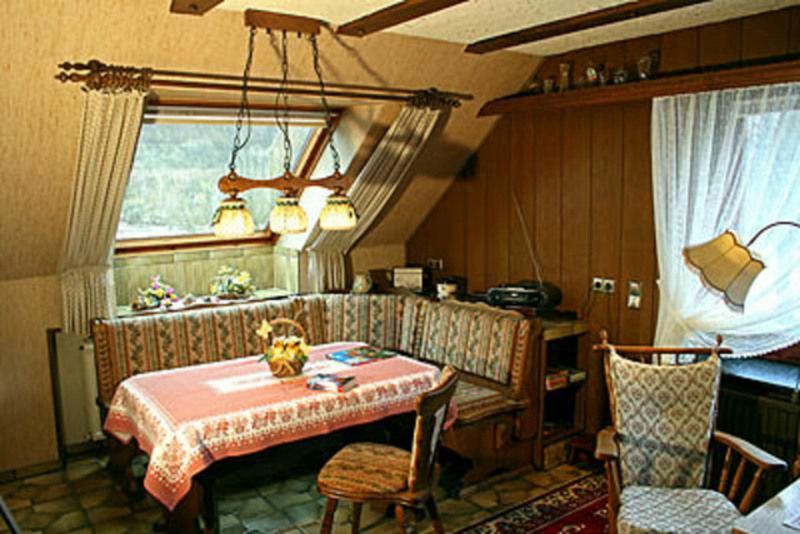 Cozy apartment for 2-4 persons (74 sqm) in an idyllic location in the nature reserve 'Sachsensteinblick' directly on a small lake with a large garden for barbecues, sunbathing or playing. The climatic health resort of Bad Sachsa is located in the southern Harz in the south of Lower Saxony. From here it is only a few kilometers to Braunlage Clausthal-Zellerfeld. Enjoy a relaxing holiday and explore the Harz. From the Hausberg Bad Sachsas, the Ravens Mountains, 659 meters above n. N., you have a view in the southern Harz and Brocken. In the ten designated Terrainkurwegen that begin on Vital Park and end, health-promoting, healing climatic walking and hiking. Visit the Valley of Salt-paradise with adventure, sauna, indoor playground, bowling alley and ice rink. In winter you can explore the Südharz on the many cross-country skiing. The apartment "House Blumenberg 'lies on the outskirts of Bad Sachsa. The Salztal Paradise is approximately 2 km away from the apartment, the city center 1 km and the station 1 km. The nearest supermarket is located in 0.3 km.